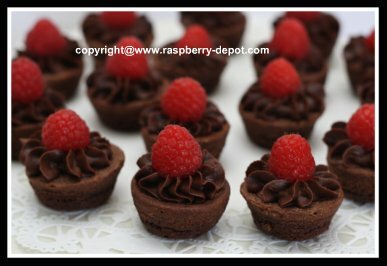 Looking for the EASIEST Raspberry Brownies or Tarts Recipe? You'll love this simple recipe to ice and decorate brownie bits with fresh raspberries in minutes! 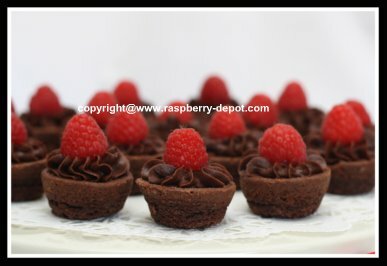 Easiest Ever Brownies /Tarts with Fresh Raspberries! I used purchased "brownie bits" instead of making homemade brownies. 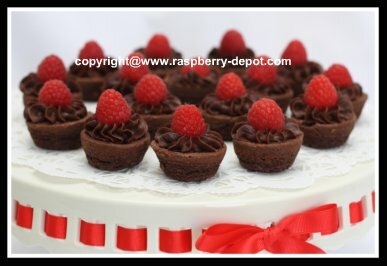 Chocolate and raspberries go together scrumptiously, and no one could resist just sampling one of these amazingly easy creations! 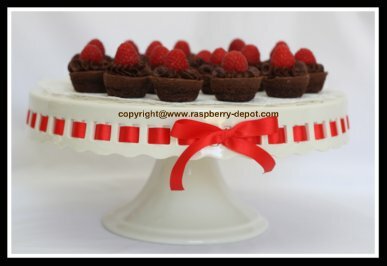 Arrange the store purchased or the homemade brownie tarts on large size plate. Using the large tipped icing bag, fill the bag with the chocolate icing. Apply icing to the tops of each of the brownie tarts. Add a fresh raspberry to the center of each iced brownie tart. Do YOU Love Gorgeous Pedestal Cake and Pastry Stands Like I do? Aren't these the most wonderful little brownie treats with fresh fruit?